I have tried in my recently new RO 4.0 grains of Titegroup with a 185 grain LSWC. It held about 10 ring at 25 yards but that's about it. I then tried 3.7, and 3.5 grains of Titegroup and the groups got worse. Today, after being given a pound of Bullseye to try that my mentor suggested I tried 3.5 grains and 3.7 grains. 3.5 grains was holding pretty close to X ring size while 3.7 was a bit wider. Maybe 10 ring if that. I'm going to try 3.3 grains of bullseye next just to see, and maybe 3.4. Now I wasn't being very scientific. I had no ransom rest. I did have a rest at the range to borrow that semi clamped my gun down but it was not very good. I resorted to the use of sand bags and achieved better results. I am only trying to come up with a 25 yard load. Something accurate but light. I'm new to the 45 and recoil in sustained fire is a bear for me to negotiate properly. The picture below is 15 shots of 3.5 grains of bullseye. The first five shots were with that bad rest. I gave it up for sand bags and the next 10 shots were all together. The stretched out flyers were part of the first five. When you are testing off of bags, the flyers are usually not the gun or the ammo. It looks like you have a good load and a good gun there. How does it do at 50 yards? I had WAY worse flyers and sporadic shots with that rink dink rest then the sandbags. Understandable that with out a machine rest there will be some human error. Because of this thought and how well 3.5 looked, I may just not try anything else and use this load as a starting point to start learning how to shoot the 45. I did not test it at 50 yards. My guess is that won't hold up very well but hey, you never know. I'm okay with developing two different loads for two different distances. I'd just get 500 rounds of ASYM or Atlanta Arms 185 JHP match ammo and use that at 50 yards. Use your reloads for 25. I'd load 1000 rounds in new Starline brass and go shoot the heck out of it. Do the USMC training exercises with your reloads. Enjoy. Tim, in my humble opinion, sandbags work best on stock guns that don't have optimum slide/frame lockups. This gun locks up good, but has a little play in the slide to frame fit but not bad. One of the tighter stock guns in this price range I've seen. Back when I shot irons and had a mentor, the load was 3.4 BE. 3.5 BE was the popular 25 yard load with a number of shooters running it at 50 as well. Then again 4.0 of BE was popular at 50. I'm sure there are several well known and popular loads but I'm also thinking it's gonna depend on what my specific pistol likes. What may shoot good for one guy may not shoot good for me and my gun. Trial and error unfortunately. I wouldn't kill myself trying to get a great load from a stock pistol. In my experience with all the RO pistols I have built, the frame to slide fit was good, bushing fit good, but severely lacked in the hood fit and barrel bottom lug fit. As a result the rear barrel lockup (front being bushing) is marginal and will greatly effect accuracy. Stock if lucky could be close to 3" at 50 yds but realistically a 5"+ pistol. The RO is a decent BE starter pistol that can be built into an excellent BE pistol. Since the lockup is marginal I highly recommend a warmer 50 yd load. Accuracy will be better. I've been experimenting recently and have found 4.2 gr BE with 200 gr Magnus to shoot pretty good from the stock RO pistols. I wouldn't go any lower. At 25 I'd definitely shoot a 3.5 gr charge. In the future a Kart barrel and bushing will make that pistol equal to any pistol on the line. 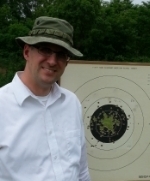 Jon Eulette wrote: I wouldn't kill myself trying to get a great load from a stock pistol. In my experience with all the RO pistols I have built, the frame to slide fit was good, bushing fit good, but severely lacked in the hood fit and barrel bottom lug fit. As a result the rear barrel lockup (front being bushing) is marginal and will greatly effect accuracy. Stock if lucky could be close to 3" at 50 yds but realistically a 5"+ pistol. The RO is a decent BE starter pistol that can be built into an excellent BE pistol. Since the lockup is marginal I highly recommend a warmer 50 yd load. Accuracy will be better. I've been experimenting recently and have found 4.2 gr BE with 200 gr Magnus to shoot pretty good from the stock RO pistols. I wouldn't go any lower. At 25 I'd definitely shoot a 3.5 gr charge. In the future a Kart barrel and bushing will make that pistol equal to any pistol on the line. What should I look for in rear barrel lock up? When in battery the barrel does not have any play or give any where that I could tell. If you have access to have pins, pull your slide stop and insert pins until the slide no longer goes easily into battery. Then compare the pin diameter to your slide stop diameter. It's a combination of several things; hood width, hood length (contributes to headspace), upper lug fit into the slide, bottom lug contact with the slide stop pin and the link. They all affect each other in some way. I like to call it a marriage. Drop in barrels are not BE quality. If with reloads I can get this gun to shoot X ring at 25 yards then I have to believe the gun is capable of 10 ring at 50 yards. Maybe not with the same 25 yard load but I still feel like there's a lot of potential in this particular gun. X ring at 25 yds doesn't take much effort. 50 is another story. Separates the men from the boys. A pistol that holds 10 ring really doesn't hold much. If you are aiming and realistically had a shot break that would be called a 9 at 3 o'clock, it could be a 8, 9, or 10 (10 ring group). A match pistol will call as fired! Don't fool yourself with a stock pistol. The RO is nice pistol, but you won't see a Master using a stock one. What's the difference in a stock barrel vs a kart barrel other than fit? Is there something to do in the twist rate? Rifling? Or is it all in fit? Fit! You can weld up stock barrels and refit and they do quite well. But upper lugs are not refittable. After market barrels do have nicer bore/rifling. 99.9% of .45's are 1:16 twist. Just because a pistol has a Kart barrel in it doesn't mean it is fit correctly. When you are ready to have a Kart put in your RO have a BE smith do the work. There is no substitute. Local pistol smith for middle TN recommendations? Tim, please note he said Bullseye smith. Kinda like a general practitioner vs. a surgeon. I understand. I'm hoping there might be one in TN I'm unaware of. Champions choice is 40 minutes from me, and the range where the TN State Champs are held is 20 minutes from me. I thought maybe there's one here...? I don't need to validate someone like Jon, because he's the expert, but I had the same experience and didn't know why until reading his post. After having my barrel stock re-fit by Springfield and a new bushing it would hold just under 3" with match ammunition, from the target they sent back, but that ammo was a little spicy, especially on the short line. When using hand loads it seemed like I was always about .2 to .3 gr above other guys with purpose built guns or kart barrels to get comparable accuracy...or at least what I perceived as comparable accuracy. I think the RO is a great buy, and you can always send it to a great gunsmith as you grow to get a new life. Tim:H11 wrote: I understand. I'm hoping there might be one in TN I'm unaware of. Champions choice is 40 minutes from me, and the range where the TN State Champs are held is 20 minutes from me. I thought maybe there's one here...? IMO, FedEx to a Bullseye gunsmith who is well known, there's a few here on the forum Shipping is a cheap price to pay for a known quality product and person backing it.